Home » awesome duuuuuuude , gears of war , guns » Want to see a REAL Lancer from GEARS OF WAR? 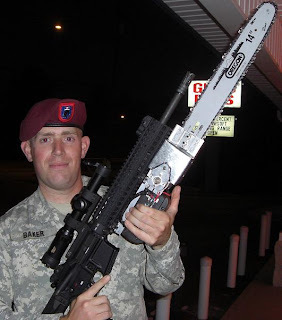 Want to see a REAL Lancer from GEARS OF WAR? I found this at the Kotaku website. Its creators have dubbed it the "Firearm Mounted Anti-Zombie Device". But fans of Gears of War will readily recognize it as a primitive version of the Lancer assault rifle, complete with chainsaw bayonet. As you can see from this video, both the gun and the chainsaw work fine. Click here for more pictures and videos of this thing in action. Really, all you need to mount the saw is to adapt a couple of mounts made for attaching to a 1913 Picatinny rail system. The Picatinny rail is the mounting standard on all modern combat weapon systems, in case you were not familiar. Now THAT is a cool toy....figured it was only a matter of time before someone came up with a 21st century model of that gun. NOW, I want to see a real pulse rifle from Aliens. heh heh heh.